Australia's east coast could be swamped by tsunamis triggered by a newly discovered string of active underwater volcanos north of New Zealand. Australian National University geologist Richard Arculus warned yesterday that the 75 submerged volcanoes posed a major threat to Pacific nations. "If any one of these underwater volcanoes either explosively erupts or collapses in a sudden movement, it would have a massive impact on the ocean, triggering a tsunami which could devastate communities across the region," Professor Arculus said. Scientists from ANU, New Zealand, the US and Germany spent the past six years mapping the previously unknown 2000-kilometre string of volcanoes running north from New Zealand up to Tonga. University of Wollongong associate dean of science Ted Bryant said the east coast of Australia had probably been swept by volcanic tsunamis in the past. But the geological evidence had been masked by a much bigger, 40-metre-high wave caused by a kilometre-wide comet hitting the ocean about 500 years ago. "It's worth being on guard," Professor Bryant said. Topographical images taken by Professor Arculus showed some of the volcanoes had collapsed in the past. But if a collapse were not foreshadowed by a major eruption, we would get little or no warning, he said. A volcano on an island in a lake in southwestern Nicaragua erupted at least four times Thursday, spewing ash that fell some 10 miles away, officials said. The 5,282-foot tall Concepcion Volcano is on the island of Ometepe on Lake Nicaragua that is popular with adventure tourists. No one was injured by the eruptions. Seismologist Virginia Tenorio said the explosions caused ash to rain down on the island's 10,000 residents. The volcano is one of two on the island, 60 miles southeast of Managua, the Nicaraguan capital. The other, Maderas Volcano, is dormant. Concepcion Volcano has registered 17 eruptions since 1883. The last was in 1999. The Nicaraguan Territorial Studies Institute (Ineter) Thursday declared a state of "green" alert to warn citizens of a possible large-scale eruption of the Concepcion volcano, some 120 km southeast of Managua. People from Ometepe Island in Nicaragua Lake were alarmed by the explosion they heard in the morning coming from the Concepcion volcano, which sent ash raining down over their houses. Ineter seismologist Virginia Tenorio told the press that since Tuesday, the center started to observe a small increase in the activity inside Concepcion on Ometepe Island. "What concerns us is that there have not been seismic (tremors)resulting from the volcanic activity, which means a major eruptioncould happen," Tenorio said. The 1,620-meter volcano is one of the most active in Nicaragua and has had permanent, low-intensity activity with small seismic tremors, constantly releasing gases and creating small explosions in the crater. The Concepcion volcano has registered 17 eruptions since 1883. 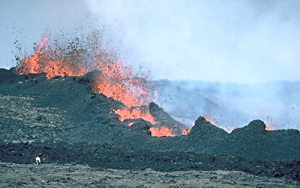 Moderate eruptions from the volcano in the 1970s and 1980s caused lava flows. The latest eruption was in 1999. The volcano in the western state of Colima, some 300 miles from Mexico City, began erupting early in the morning, El Universal reported. The Colima volcano, also known as the "fire volcano," emitted some smoke in June. A month before that, the cone experienced its first major eruption in six years, prompting the evacuation of towns near its base. The situation in Andaman and Nicobar islands, which was rocked by a major under-sea earthquake on Sunday, was gradually getting normal even though some minor tremors were felt today. "The situation is normal today and there is no fear among the people", Lieutenant Governor Ram Kapse told PTI. There were, however, a couple of minor shocks during the day but the situation was not alarming like last night when an under-sea earthquake of 7.2 magnitude rocked the entire range reviving fears of another tsunami like December last year. The abnormally high tide in the sea around the island for the last couple of days was also easing today as sea water was gradually receding. With the situation getting back to normal in Port Blair town the islanders were seen getting back to their usual activities during the day. The authorities were also exploring any linkage between the volcanic eruptions in the Barren island and the fresh tremors in the island range, an official source said. The Barren island, which is India's only live volcano, has been spewing lava for the last few months and the eruptions were still on. The entire Andaman and Nicobar islands were rocked by an under-sea earthquake at 9:12 pm last night, the epicentre of which was located 60 km southwest Nicobar Islands and 420 km from Port Blair. There were, however, no damages or casualties anywhere in the island. This news may be a week old, but I think its still interesting. Apparently there is still some activity at Mount St. Helens. A magnitude 3.0 earthquake rattled Washington's Mount St. Helens, triggering a rockfall and sending an ash plume above the rim. "This is the largest quake that has occurred in some time, and its exact cause is under debate," according to a statement from the U.S. Geological Survey. Earthquake activity sometimes precedes volcanic eruptions, but scientists can't yet make firm predictions from the seismic activity. While the volcano has been relatively quiet lately, a lava dome inside the main crater continues to grow. Minor eruptions of ash and volcanic gas have been common. An eruption "could intensify suddenly or with little warning and produce explosions that cause hazardous conditions within several miles of the crater and farther downwind," says the USGS. Mount St. Helens sprang back to life last fall with a series of strong eruptions that spewed ash miles into the sky. It is possible to visit Hawai'i Volcanoes National Park (808-985-6000, www.nps.gov/havo) on your own, but to see hot lava, a knowledgeable guide makes the expedition safer and more interesting. I traveled with VolcanoDiscovery (www.volcanodiscovery.com, info@volcanodiscovery.com), which also offers tours of volcanoes in Italy, Greece and Indonesia. I appreciated the pairing of Phil Ong's island smarts - he's a local geologist - with Dr. Tom Pfeiffer's breadth of knowledge. Groups on fixed-date tours range from two to 10 people, though the team specializes in custom bookings. I was lucky and saw a high degree of volcanic activity, but note that eruptions can be notoriously fickle. The five-day Hawaiian expedition without airfare costs $3,200. Should you seek a shorter volcano expedition on the Big Island, VolcanoDiscovery's expert lava guides offer half-day trips for about $235 or full days for about $350. 25 years ago today, 1980: Mount St. Helens was back at it again with a spectacular series of eruptions that hurled ash 11 miles into the air and sent it wafting into Canada. The eruption came as a surprise to scientists who thought the recent lull in the volcano's activity indicated that pressure was being released rather than building up inside. 50 years ago today, 1955: A modern shopping center costing in excess of $1 million was being proposed for the Urbandale area by a Kalamazoo developer. A supermarket would be the major unit in the center. 100 years ago today, 1905: A new $3,000 brick chimney at the Nichols And Shepard plant was completed. It was a lofty affair, towering 125 feet in the air, and was 11 feet at the base, seven feet at the crest. This week marked 10 years since the Langs Soufriere volcano erupted from its quiet state to disrupt the peace and quiet that Montserratians and many visitors to the island have long enjoyed. The island after that day was never the same again. Montserrat was devastated in 1995 by a series of eruptions, beginning with the venting of steam and ash from mid-July 1995, and developing into larger eruptions over the following months. The population fell from 13,000 to 1,500 immediately as residents made hasty preparations to evacuate. Many migrated in the first instance to neighbouring Antigua and then to other countries in the region. Later, citizens of the British dependency made their way to the United Kingdom, where large portions of the population have since settled. Montserrat today is vastly different from its pre-eruptive state, Attorney Warren Cassel said. Cassel is a native of Montserrat who practices law here in Antigua. The town, the hub of commercial activity, was in the "hot zone" and businesses were forced to relocate - many renting homes in residential districts. "Imagine if one day with no warning St. John's was shut down and everyone had to move to the Jennings area," Cassel said. "Most people lost something during the crisis; some lost everything. What had been built up over 300 years vanished in the twinkling of an eye. Montserrat had to start all over again." The new airport was lost as were the newly built hospital, the port, library and schools, which were situated in Plymouth. Today Montserrat is only beginning the recovery process. The population now stands at roughly 4,500. Valuable parts of the country's infrastructure have yet to be recovered. One local calypsonian sang of all the "temporary facilities' in Montserrat; sad, ironic humour. The temporary wooden structure built to house the government headquarters is still in use, as the government struggles to rebuild. The Chief Minister's Office has recently been completed. The private sector is largely stagnant with neither sufficient capital nor the necessary population size to sustain most businesses. The much-celebrated new airport has become a bone of contention among Montserratians. It can only accommodate the 14-seater sized planes currently used by WINAIR and, according to Brandt, is built in a location that does not allow for expansion. Other Montserratians have also expressed disappointment that the government accepted the proposal for such a small airport. What makes matters more difficult is that at the end of July, the government's contract with the ferry and the helicopter services that currently shuttle Montserrat's residents to and from St. John's, Antigua, will come to an end. Without the ferry, Montserratians will be completely dependent on WINAIR's flights for all travel to the outside world. Flights that are significantly more expensive than the ferry is, and which only allow 40lbs of luggage for any one passenger. By all accounts, however, the greatest difficulty that Montserrat faces is the incredible brain drain occasioned by the mass migration following the volcanic activity. Brandt makes the point that while many of the migrants benefited from the opportunity to further their educations in the UK, Montserrat itself is getting no benefit from the advancement of its citizens overseas. A decade after so many locals migrated, many young Montserratians are strangers to the land of their birth. "The government has not done enough to encourage people to come back o Montserrat," Cassel said. It is a sentiment echoed by Brandt, who twists the problem into a cruel irony: if Montserrat's natives return, where will they go and what will they do? "The civil service is of a particular size; the private sector is of a particular size and the government is the only engine of the economy. "The brightest of the young people are in England and you have people of moderate talents remaining at home. "You cannot build a country except with the brightest young people," said Brandt. In short, one decade after the volcanic activity first began; Antigua's neighbour is still healing from the wounds inflicted by the powerful forces of nature that awoke from slumber 10 years ago. The healing has begun but there's still a lot of work to be done. This is one of the volcanoes situated in Hawaii National Park. From the day the volcanos started creating these beautiful "pearls of the ocean" something wonderful happened. Adventure was born! The Big Island is home to volcanos, whales, dolfins, and some of the most interesting and abundant flora, fauna & scenery to be found. We traveled from my home in Oahu to see the Big Island and it was a special treat to see! The Volcanos are amazing! How immense they are and you will feel absolutely tiny when you are standing around them. Do something unique and visit Punalu'u Black Sand Beach and see the giant sea turtles (but please don't touch them as they don't have any protection from our bacteria and are dwindling in number). Black sand beaches evolve from ground lava after years of pounding by the surf against the lava poured over the land by the ever present volcanos. Punaluu Black Sand Beach offers surfing, horseback riding, snorkeling, deep sea fishing, hiking and whale watching to name a few things. You can hike to nearby Ninole Cave Park where all you spelunkers can explore the caves (Don't forget to take flashlights with you). The Macadamia Nut Orchards are famous and you won't want to miss the lava tubes that you can walk through. On some of the tours you will see men and boys climb coconut trees up to 80 feet tall! On one tour I took we saw a man open a coconut husk with his bare hands and then cracked it open and we enjoyed some fresh coconut meat! It was an exciting experience to enjoy food that can sustain life in a way that ancestors of the islanders have done for many years. Joe West Photo (see below)Some of the most beautiful flowers in the world can be found on the islands. Birds of Paradise almost look as if they will actually take flight at any moment. Fowers abound. We made leis from the Plumeria's in our front yard and enjoyed Bird of Paradise, Hibiscus, and many more flowers year around. Other exotic flowers you will see include heliconia, orchids, gingers and more. Paradise is Hawaii. You'll find rainforests, beautiful secluded waterfalls, trails, pools, rivers and so much more! The islands are also rich in multiple cultures and history! If you ever get a chance to go I would also suggest you visit during Lei Day festivities. This Mexican volcano shows signs of activity! The Popocatepetl volcano in Mexico has shown increased activity since last Thursday. Steam and ashes could be seen over Mexican volcano Popocatepetl on Thursday as authorities reported increased activity over the past 24 hours. According to officials from Mexico's National Disaster Prevention Centre, the massive volcano registered 15 eruptions in the 24-hour period from Wednesday to Thursday. The explosions have ranged from small to moderate exhalations and scientists have labelled the activity as phreatic. Although the emissions primarily consisted of water vapour, gas and ashes, the volcano registered a moderate explosion followed by a tremor. That tremor produced an emission of ashes that reached 2 kilometres over the crater. The well-used taxi manned by George White lumbers up the road to St. George's Hill. As we approach the summit, White slows so I can appreciate the nearly ripe bounty of mangoes hanging from five trees next to the road. The landscape is green and serene, with cows grazing contentedly. At first glance, you could be on almost any one of the Caribbean's mountainous islands. But then we pass a scattering of derelict, abandoned houses, a few with collapsed roofs. There's not a human sound in the air -- no soca music from a passing car, no children laughing in the street. As we crest the hill, the culprit responsible looms into view: Montserrat's Soufriere Hills volcano stands before us, implacable and all-commanding. Ten years ago this month, the volcano reawakened after three centuries of slumber. Steam and gas still exhale along the rim of the crater, concealing remnants of the enormous lava dome that has bulged and collapsed repeatedly during a decade of eruptions. But vulcanologists believe that Soufriere Hills may be entering another period of repose. What's left of the dome is out of sight, and my eyes follow the path of now-cool ash flows that roared over the crater walls and down the flanks of the peak. One crashed against the base of St. George's Hill and headed into Belham Valley, consuming a golf course. Another ash flow continued west, rolling over the former capital of Plymouth. The settlement had been inundated, one eruption after another, creating a ghost town under a blanket of ash more than three metres deep in places. It's been said that Montserrat -- 19 kilometres long, 11 kilometres wide -- is precisely the wrong size for an erupting volcano. If it were smaller, full evacuation would have been inescapable. Instead, when Soufriere Hills came alive in 1995, only the southern two-thirds was declared unsafe. The capital and its residents were moved north, crammed into a few square inhabitable kilometres, ducking the sometimes heavy ashfall (and coming out for the inevitable cleanup). In June, 1997, a major collapse occurred, sending a cloud of ash, gas and rock exploding down the mountain, scorching everything in its path. Nineteen people, most of them farmers tending crops in the restricted area, were killed and the island's airport runway was buried. Since then, Montserratians who stayed have coped with the conflagrations, while England pumped money into rebuilding the infrastructure (the island is a British Overseas Territory). The population dwindled to about 2,500 residents, down from 11,000 in 1995. Although two small hotels and other lodgings were open, the island had just under 8,000 stay-over visitors in 2004, most arriving via the heavily subsidized ferry that travels twice daily from neighbouring Antigua. But today, Montserrat is finally looking at a more positive future. There's been no new dome growth for two years. Islanders who settled in England and the United States are returning, bringing the population up to about 4,700. A new $23-million airport opened this week with regular commercial flights to the island from St. Maarten and Antigua. The government, with subsidies from Britain, is spending $3.4-million over the next three years to promote tourism and build parks and nature trails. For my visit in June, I landed at Little Bay, in the north, where the capital has been rebuilt. I meet George White, who takes me through St. John's, the home of the audacious new airport, which flanks a ridge well above sea level. We continue over to Jack Boy Hill, a lookout at the road's end. The east-side landscape is awesome -- broad grey flows of ash flood the formerly green slopes, extending the shoreline out by several hundreds metres. The bare outline of the former airport can be spotted. Picnic tables are set up for nights when volcanic activity can be appreciated from this safe distance. Before its last collapse, the dome's elevation had grown to more than 1,100 metres, towering next to the island's official "highest" point, 915-metre Chances Peak. On many days, lava was extruded at a volume comparable to two or three refrigerators a second. These weren't the swift-moving orange rivers one sees in Hawaii. Montserrat's lava is viscous, rising slowly within the crater bowl for weeks or months, until the superheated unstable dome would disintegrate under its own weight, crashing down the slopes to obliterate everything in its path. The Montserrat Volcano Observatory, perched on the slopes of Centre Hills, offers another remarkable view. Tours of the observatory are conducted by scientists Tuesday and Thursday afternoons, offering the latest prognosis on the future of Soufriere Hills. Today's report: The scientists are cautiously predicting a slowdown in activity. "If it was a heart patient, you'd be giving CPR by now," jokes Vicky Hards, the resident vulcanologist. Tasked with taking the pulse of a dying monster, scientists will be keeping a close eye on Montserrat for years to come. Mick Strutt, another vulcanologist with the observatory, says it will take time before scientists can identify a date when they'll be able to determine that the eruption has ended. Soufriere Hills isn't the only sightseeing attraction the island has to offer. Ishwar Persad, marketing manager for the Montserrat Tourist Board, says the diving and snorkelling are excellent -- in part because of the island's low population and minimal pollution -- and birdwatchers come to spot the Montserrat oriole, among other species. "There are six hiking trails now and six more in development," Persad says. "We have deserted pearl-grey beaches where you can go and you won't be harassed like on some islands, and you can rent a bike and explore the villages. I make one more stop, at the ruins of Plymouth. The road into town passes a cemetery swathed in ash, the gravestones barely peeking up. Rainfall on the upper slopes has created deep new gullies, while in other areas the hardened ash flows are high enough that one can step from the ground onto the roofs of some downtown buildings. A shoe store sits idle, its dirt-covered inventory still perched on the racks, while another shop has shelves of spices and sodas. I open an ash-caked bottle of black peppercorns and discover their fragrance is still intact. I consider for a moment carrying it home as a souvenir, until I realize I'm standing in a modern-day Pompeii. Montserrat's new airport opened this week, and WinAir (1-888-255-6889) offers four daily flights from St. Maarten and Antigua using 19-seat DHC-6 aircraft. A promotional fare of $123 is in effect. The 144-passenger ferry from Antigua to Montserrat takes one hour, and currently runs twice daily except Sundays. It costs $93 round-trip. The schedule will be re-evaluated after the airport's opening. By taxi: It's easy to explore the island on a day trip. The going rate for a full-day driving tour is $124, for up to four passengers; check with Thomas Lee (664-492-1649) or George White (664-492-1342). Tour companies: Antigua-based Jenny Tours (268-464-4188) and D and J Tours (268-464-9453) do day trips from Antigua for $149-$198, including ferry, driver and lunch. Vue Pointe Hotel: (664) 491-5210; vuepointe.com. The 22-room hotel opened in 1961 and offers cottages with views of the volcano. The Wednesday-night barbecue has been an institution for 40 years, and the black-sand beach is bigger than ever. Doubles cost $130 to $149. Tropical Mansion Suites: (664) 491-8767; tropicalmansion.com. The 18-room hotel opened in 1999 on a hill near the new airport. What it lacks in charm it makes up for with modern amenities, like air conditioning in four rooms. Doubles cost $148 to $186, including continental breakfast. Montserrat Tourist Board: (664) 491-2230; visitmontserrat.com. A magnitude 3.0 earthquake rattled Washington's Mount St. Helens Friday morning, triggering a rockfall and sending an ash plume above the rim. The moderate temblor occurred at 5:22 a.m. local time. While such a quake would not likely be felt by most people, sensitive instruments on the mountain have no trouble detecting it. The volcano's last major upheaval was in 1980, when 57 people were killed. Ten years ago today, the British island of Montserrat was "the Emerald Isle of the Caribbean", an upmarket getaway for celebrities and pop stars from Elton John to Eric Clapton. Its capital, Plymouth, was throbbing to calypso and soca rhythms, and the locals and tourists were enjoying the national dish of "mountain chicken" (a giant frog) or sipping rum punches on its shimmering black sand beaches. But the lives of the 11,000 islanders were about to change forever. On 18 July 1995, the lush green Soufriere Hills, a favourite picnic site amid mango and breadfruit trees and thundering waterfalls, began to rumble and steam. Hardly anyone on the island had been aware that the ring of peaks above Plymouth formed the rim of a still-active volcano. These rolling hills just did not look the way a volcano is supposed to look. And there had been no eruption in recorded history. By August 1997, the steam had given way to massive eruptions of magma, and Plymouth became buried by pyroclastic flows of red-hot ash, gas and rock, turning it into a modern-day Pompeii. Though the town had been evacuated, 19 people were killed by a single pyroclastic flow on surrounding farmlands. On the other side of the island, the picturesque little W H Bramble airport was also buried, leaving Montserrat accessible only during daylight hours, by helicopter or a gut-churning one-hour ferry ride from Antigua. This week, in what the islanders celebrated as a historic occasion, something resembling normal service was resumed. To great fanfare and cheered by a quarter of the island's 4,800 remaining residents, the first fixed-wing plane for eight years flew in to a new airport, squeezed on to a rugged plateau at Gerald's, in the northern "safe zone" where the remaining islanders live in an area of only 13 square miles. After the police band played "God Save the Queen" - the island is one of Britain's few remaining colonies, now called overseas territories - Chief Minister John Osborne told Caribbean dignitaries and cheering children: "This is a day of celebration and new beginnings, of rejuvenation and rebirth. Montserrat is open again for business." Deborah Barnes Jones, the British governor, added: "It's a red-letter day for Montserrat." Her twin teenage daughters are at boarding school in England but visit the island regularly. "I don't want to say we're now on the map, because that sounds as though we'd dropped into the Bermuda triangle." She and Mr Osborne then boarded the inaugural outward flight, to neighbouring Antigua, on a 19-seat Twin Otter aircraft of Windward Islands Airways (Winair), based on the Dutch island of St Maarten. Mr Osborne said he wanted to take the flight "to show everyone that our new Gerald's airport is safe". Critics had said the 600-metre runway was too short, and, on such a windy slope, would be tricky for pilots. In fact, it was the only option in the mountainous "safe zone", although it required considerable engineering skill by the Belfast-based Lagan International. The little planes may take only 19 people at a time, on four flights a day to Antigua and St Maarten, but Montserratians see the air link as highly symbolic after 10 years as virtual refugees on their island, moving farther north as their homes in the southern two-thirds were destroyed or the danger zone was extended. They are already calling the new airport "our gateway to the world". The helicopter flights to Antigua were expensive and hard to get seats on. The ferry ride, of more than an hour, was gruelling over the huge Atlantic swells. Sick bags were issued to every passenger and often used. "An airport is one of the most important ingredients for rebuilding our economy," Chief Minister Osborne said. "Planes bring tourists, tourists bring business to other sectors, tourism gives confidence to investors." For much of the past 10 years, the islanders were in shock. Only recently has it dawned on them that they will not be going back to their beautiful south soon, perhaps not even in their lifetimes. But, with a new airport, they now feel they are moving on. Cricket is still their first love, but a new hilltop football stadium in the Blake's area is attracting more and more fans to cheer the national side, coached by Ruel Fox, the Montserrat-born former Norwich winger, into improving on their Fifa ranking of fourth-worst team in the world. "We're not there yet, not by a long way, but everything is moving forward," said Margaret Wilson, originally from Sunderland but who has lived on the island for more than 20 years with her partner, local fisherman Danny Sweeney, a descendant of African slaves and Irish Catholic refugees who first came to the island. They have moved back to their famous rickety restaurant/bar, Jumping Jack's, by the beach at Old Road Bay after digging it out from a layer of thick, black ash. Volcanic ash is like dry cement and has to be disposed of. "There's a feeling that we're all getting going again," said Ms Wilson, a blonde Joni Mitchell lookalike who cooks and serves her partner's freshly caught wahoo to anyone from the governor to visiting former resident Sir George Martin. In the 1980s, the former Beatles producer's Air Studios on the island brought some of the world's biggest stars, Elton John, Paul McCartney, Eric Clapton, The Police, among others. The studios are now blanketed in ash and abandoned but Sir George is helping with the island's reconstruction. Work has started on a new cultural and community centre at Little Bay, by the ferry terminal in the north, from funds he raised at a star-studded concert for Montserrat in the Royal Albert Hall in 1997. They hope to open it on St Patrick's Day next year, which is a major holiday because of the island's historic Irish connections. Most people here, black, white or mixed, have Irish surnames. When Sir George's project was placed there, it looked as though Little Bay, formerly nothing more than a quiet fishing jetty, was favourite to become the site of the new capital, to replace Plymouth. But new government buildings, schools, a new Bank of Montserrat building, new police and fire stations, and a new office for the governor, all in the hillside village of Brades, have turned the latter into something of a de facto capital. "Old Road Bay beach used to be my favourite place in the world," Ms Wilson added. "It's not what it used to be but we're getting there." The beach, where Sting learnt to windsurf, and cruise line tourists used to come ashore to sip cold Carib beers on the black volcanic sand, is now covered in ashy silt. It is not attractive, but the ocean itself is clean and clear. That is why Bryan Cunningham, a South African diving instructor, has moved next door to Jumping Jack's and set up a diving school and shop in what used to be a renowned beachside bar called The Nest, formerly run by Danny and Margaret Sweeney in the pre-volcano days. "I've been all over the world looking for the best diving site and this is it," he said. "I think it will prove worth the investment, despite the volcano. This island is truly a Paradise Found for divers and travellers the world over." Tourists have started trickling back, mostly to dive in the coral reefs or hike the mountain trails, but also out of curiosity, to see a live volcano. The Montserrat Volcano Observatory, which is manned by British and Caribbean scientists, organises guided tours as close to the volcano as you would want to go. On the slopes above Old Road Bay, the Vue Pointe, once among the great five-star hotels of the Caribbean, has had its ups and downs since the volcano erupted. Its owners, Cedric and Carol Osborne, have had to abandon it several times, and dig it out from layers of thick ash to reopen it again. Its rooms, luxury octagonal hillside villas with direct line of sight to the volcano, have often lain empty. Now they are full and overflowing. First, there were the visiting dignitaries and journalists for the airport inauguration. But in the coming week, the hotel is also hosting a major international conference of 120 of the world's leading vulcanologists, titled, "The Soufriere Hills volcano - 10 years on". 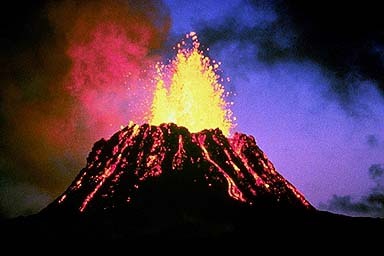 The experts say that, due to developing technology, no volcano has been studied as much as this one. They describe it as "a natural laboratory for the science of volcanology" and can watch it from the state-of-the-art observatory, fewer than two miles from, and in direct view of, the crater rim. If that sounds close, it is. The observatory is on the border between the "safe" and "exclusion" zones. But it is built on a high hill, and the experts believe that, in a major eruption, gravitational pyroclastic flows would follow the ghauts (ravines) and valleys and that the observatory would be safe. They should know. Most of the 6,000 Montserratians who fled over the past 10 years, largely to Britain, are not quite so sure. Few have returned. Though the population has risen from a low of less than 3,000 to the present 4,800, many of the new arrivals are from other countries in the region, notably Jamaica, Guyana and the Dominican Republic. The problem is that the island needs Montserratians to return from England and elsewhere to revive the tourism-based economy. But the exiles need a revived economy to attract them back. Down in the Belham River valley, close to Jumping Jack's bar, the picturesque 11-hole "Royal Montserrat Golf Club" course has long been buried under lahars, or mudslides, from the volcano. But there is talk of building a new one, optimistically even closer to the volcano, at Fox's Bay. That is inside the danger zone but some residents have moved back into the area and believe it is relatively safe. They are allowed to enter the zone during daylight hours, though warned to stay tuned to local radio. But some are defying the official line and staying in their cleaned-out homes round-the-clock, despite lack of phones, water or electricity. Everything, of course, hinges on the volcano. Will it blow again is the big question. A major report from the experts at the observatory in April said there had been no new "dome growth", that is, the volcano was not expanding the way it does before major eruptions. But they said there was a 23 per cent probability of an eruption of magma within the next year, and a 10 per cent probability that such an eruption could be "large". The report added: "We stress that the exclusion zone remains a dangerous place in the event of any explosive resumption of activity." So the risks remain. But that has not stopped a recent boom in the property market. Houses you could not give away in the years after the major eruptions are now being snapped up, many by British buyers making use of the pound's strength against the US dollar, and therefore the fixed-rate east Caribbean dollar. Villas with swimming pools and overlooking the ocean, worth hundreds of thousands of pounds before the volcano, fell in some cases to five figures at the worst of the crisis as pools were filled with heavy, hard-to-remove ash. Now, in the Old Towne area, around the Vue Pointe hotel and just inside the "safe zone", you would be lucky to lay your hands on a villa, regardless of the price. Another major eruption is a risk some people are prepared to take to live on what they hope will be Paradise Regained. But all of them keep a shovel to hand. Can NASA new software identify things such as volcano eruptions? Future versions of the software also might be used to track dust storms on Mars, search for ice volcanoes on Jupiter's moon Europa, and monitor activity on Jupiter's volcanically active moon Io. NASA's New Millennium Program developed both the satellite and the software. The program is responsible for testing new technologies in space. Anatahan's volcano is still spewing steam and gases, but residents of Guam may not even notice, according to the National Weather Service. "It is putting out ash and a little steam," said Carl McElroy, senior forecaster for the National Weather Service, noting that northeast winds have carried the plume westward to the Philippine Sea. "It is well north of Saipan and Tinian," he said. The volcanic island, located about 200 miles north of Guam, suddenly began erupting at 5 p.m. May 10, 2003, according to the U.S. Geological Survey. The eruptions continued for half a month, sometimes blowing ash and the smell of rotten eggs over Saipan and Guam. The volcano has had eruptions within the past years, sometimes spewing volcanic ash to Saipan and Guam. Advisories have been issued in the past for volcanic haze, which has made some students sick. "Keep an eye on it," McElroy said, but added that the volcano has died down somewhat and people in the Marianas may not see much volcanic activity. A decade after a series of volcanic eruptions smothered two-thirds of Montserrat in ash, the Caribbean island is set to reopen its airport. Locals hope the move will help jump-start the British territory's long-dormant tourist industry. Visitors welcome: A cove at Woodlands Beach overlooks the Atlantic Ocean at Montserrat. Starting Monday, St. Maarten-based Winair will fly four times a day to Montserrat from Antigua. Round-trip promotional fares for the 20-minute, 19-seat Twin Otter trip start at $99. The airport, along with two newly built towns, is in the northern "safe zone," considered beyond the reach of the Soufrière Hills volcano that buried the former capital, Plymouth. Soufrière Hills rumbled to life last week for the first time in two years and remains a centerpiece of Montserrat's nascent tourism campaign: An observatory offers tours, and escorted visits to Plymouth — a modern-day Pompeii — are in the works. Did you know there's a volcano in southeast Austin? It's true. St. Edward's University is built on the mouth of a volcano that dates back 80 million years. If you're wanting to learn about the history of our landscape, this is a great place to start. All you need to do is head up to Blunn Creek Preserve in south Austin. There you'll find what's called volcanic tuff, the ash that came off of the volcano that sits underneath St. Ed's. During that time 80 million years ago, this area was covered by a sea about 200 feet deep, and it wasn't the only volcano. "There are 200 of these submarine volcanos all along what's called the Balcones Fault Zone," said Chris Karan, a geologist. So will it ever erupt again? Karan says they never say never when it comes to Mother Nature, but it's been extinct for close to 80 million years. Volcano holds key to future eruptions? From 1987-95 the Yellowstone caldera subsided and contracted.From 1995-2005 it rose and expanded. From 1996-2000 the land around Norris rose about five inches and "then it stopped," Henry Heasler said. "It's telling us something - what, we don't know," the park geologist said Tuesday at the Buffalo Bill Historical Center.Yellowstone's dynamic landscape is under constant monitoring, which Heasler said he hopes will allay some fears about a catastrophic occurrence. If one were to happen, indications would begin at least months, if not years, in advance, he added. "Yellowstone is one of the world's largest active volcanoes," he said. The indicators comprise 10,000 or more hydrothermal features, including 300-plus geysers, seismic activity, including 2,375 temblors in 2002, and active ground deformation of inches per year. "That's unusual," Heasler said.The three major eruptions occurred 2.1 million years ago (6,000 times as powerful as Mount St. Helens), 1.3 million years ago and 640,000 years ago with the last lava flow 70,000 years ago or less. "Lava flows created the topography you currently see," he said.The most recent eruption created the caldera, the volcanic crater, that collapsed afterward. It measures 45x35 miles and sits in the middle of the park. Numerous earthquakes occurred in the park last year, many in the west-central area.Despite all the activity and recent media hype, Yellowstone is not about to blow up and destroy the world, Heasler said. Caldera-forming eruptions are infrequent and occur hundreds of thousands of years apart. "And we don't know if there will be another," he added.Eighty eruptions have occurred since 640,000 years ago, along with lava flows, but no large, catastrophic ones. Large hydrothermal explosions have also occurred, such as the one that created Mary Bay. The 5-10 in the last 14,000 years happened generally around the lake.Most common are small, hydrothermal explosions, 20 since 1872 including the most recent, Pork Chop Geyser in Norris in 1989. "They have local effects only," he added.To predict a major eruption, the U.S. Geological Survey watches for signs such as large and shallow earthquake swarms, deformation involving yards of uplift, change in gas emissions, steam explosions and hydrothermal alterations. "They've all occurred in the past several years, but the big thing is - not in the same area," Heasler said.If all the indicators converged, they would signal an impending eruption, he added. One sign or a combination of signs does not indicate an eruption.The Yellowstone Volcano Observatory project comprises 24 seismic stations, "with a 25th, I hope, this year," he added. "We try to make them as unobtrusive as possible, but they're necessary for visitor safety. "The solar panels powering the equipment are camouflaged among tree branches. The three stations around the lake will provide "real-time information about deformation," Heasler said. Scientists also monitor the hydrology. "We don't manage the geologic resource. The geologic resource manages itself fine," he said. "We want to make sure we don't alter anything. "One piece of equipment measuring the flow at Tantalus Creek tracks Echinus Geyser's eruptions. The data are posted on the observatory's Web site, gathered recently showed changes in one area of Yellowstone Lake that harbors an underground geyser basin. Instead of calling the activity a "bulge," Heasler said he prefers the moniker "non-inflated plane" or "Nash Creek/Storm Point vent system. "The research created a flurry of predictions about eruptions. "We have to be careful when we name features," Heasler added. "Yellowstone is a natural laboratory," where scientists continue to gather information, he said. "The three words I say most in Yellowstone are, 'I don't know. '"The technology assists the monitoring and provides baseline data for a warning if conditions warrant. "We have no final answers, yet," he added. An explosion inside the smoldering summit of western Mexico's Volcano of Fire sent ash and gases nearly three miles into the air late Tuesday, but did not cause any immediate evacuations. Authorities said the eruption was not as large as several spectacular explosions the volcano unleashed last month, but was still stronger than a well-known July 1999 blast that sent glowing rock down its slopes and a plume of ash five miles skyward. There were no reports of damage, but authorities were searching the area around the 12,533-foot volcano to ensure evacuations were not necessary, said Jorge Sapien, a spokesman for emergency response teams in Jalisco state. The volcano is 430 miles west of Mexico City and is considered among the country's most-active and potentially most-destructive volcanoes. Seismologists say the increasing frequency of eruptions and their intensity are signs that the volcano is returning to an explosive stage like one that started in 1903. In that era, the eruptions climaxed with a massive explosion in 1913, which left a 1,650-foot deep crater at the volcano's peak and scattered ash on cities 240 miles away. Records aren't clear if there were any casualties. Commutes to work can become monotonous trips, boring even the most intent traveling aficionado. Glen Mattioli is one of the few people who embraces them. Then again, not everyone’s job takes them to the Caribbean. Mattioli, an associate professor in the Department of Geosciences at the University of Arkansas, and a team of researchers have been trekking regularly to the island of Montserrat since 1995 to examine Soufriere Hills volcano. "We hope to understand in a physical way how these volcanos work, then to use that information to predict eruptions," Mattioli said. "We’re monitoring the volcano and trying to tie our findings to properties we understand." Soufriere Hills has been in the throes of a prolonged eruption since the researchers began studying it. The 10-year flare-up has led to the emigration of half of Montserrat’s 11,000 inhabitants, stymied the tourism industry and submerged the airport in a pyroclastic flow. The island now is a living observatory for scientists dedicated to learning how to assess hazards and forecast volcanic activity. Nearly 100 scientists will gather in Montserrat the third week of July to mark the anniversary of the volcano’s latest active period with "Soufriere Hills — Ten Years On." Mattioli will deliver the keynote address. His inquires have been conducted with Barry Voight, a geology and civil engineer professor at Penn State University; and Peter Malan, a seismology professor at Duke University. Also assisting has been UA graduate student Liz Van-BosKirk; UA math graduate Neil Jones; undergraduates John Micshler of Augustana College and Jonathan McBee of Wheaton College in Massachusetts; Eylon Shaler, research professor of seismology at Duke University; and Brian Schleigh and Dr. Mike Acierno of the Carnegie Institute, who provided technical support. The team also has added Cornell University professor Larry Brown, a reflection seismologist and the head of the Institute for the Study of the Continents. Past work on the island has included the National Science Foundation-supported CALIPSO (Caribbean Andesitic Lava Island Precision Seismo-geodetic Observatory) project. 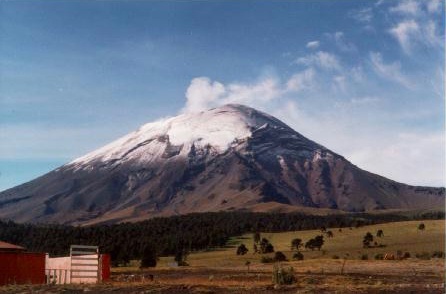 The program in which four high-sensitivity stations were installed around the volcano to measure ground deformation and record detailed measurements of volcanic activity. Through past efforts, researchers have concluded pyroclastic flows can incite small tsunami waves. They also located several pressure points at depths that appear to be active at different times. In their latest proposal, they hope to learn the strength of the earth’s crust and its rigidity and how it transforms during eruptions. The new experiment — titled SEA-CALIPSO (for Seismic Experiment with Air-gun source) — will use air guns and a string of sensors off the back of a research ship combined with sensors on land in an attempt to image Soufriere Hills’ magma chamber. The air guns will create seismic waves that will reverberate through the earth. As the waves propagate, a certain percentage of the energy created is reflected and can be measured by the sensors. The direction of that energy is related to the properties of the material the waves pass through, and based on the direction, scientists can determine if the material is gas, liquid or a combination of liquids and solids. Researchers also can use the speed of the waves to determine information about temperatures, which can help pinpoint whether the material in the magma chamber is liquid, solid, gas or a combination of the three. They will chart the speed and direction of the various waves to get an image of the shape and contents of any underground chambers. SEA-CALIPSO was scheduled for last May, but the team postponed the experiment after encountering some barriers. Some concerns have been voiced regarding the environmental impact the seismic waves will have on marine life in the area. Another hindrance was the boat they intend to use is a British research vessel primarily stationed in Antarctica. Its crew was unable to make the journey in May. "Everyone’s pretty excited about that experiment," Mattioli said. "We were really disappointed it didn’t go." For now, the team’s main goal is to publicize their current findings along with their future goals in hopes of garnering more funding from the science foundation or other sources. A volcano has erupted underwater near the Pacific island of Iwo Jima off the coast of Japan, sending a column of steam rising a kilometre into the air. The Japanese Coast Guard sent a plane to investigate, according to reports, after Defence officials reported that the surface of the water appeared red in the region of the steam column. Larger eruptions in the area have been recorded three times in the last 100 years, each eruption large enough to form a new, but quite small, island, according to a paper from the American Geophysical Union. More than 30 smaller eruptions, apparently similar to this one, have been recorded in the period. 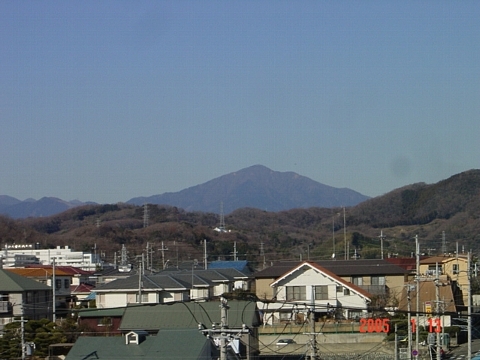 Most recently the volcano, Fukutokuoka-no-ba, erupted in 1986. The eruption lasted for three days. The Japanese Coast Guard issued a warning to international vessels, advising them to steer clear of the area. Meanwhile, the Japanese Metrological agency said there was no danger of the eruption causing a tsunami. Tuesday, July 05, 2005 Anatahan's volcano reawakened anew following reports that volcanic activity appeared to be waning, displaying a series of strong explosions that sent ash to 40,000 feet in the air.The eruptions sent a stream of volcanic smog over Saipan and Tinian, prompting Gov. Juan N. Babauta to issue a volcanic haze advisory late Sunday night and advise those with respiratory illnesses to stay indoors.However, the smog dissipated early in the morning yesterday without resulting in an ashfall that could have spoiled Liberation Day activities. Early Sunday afternoon, the U.S. Geological Survey and the Emergency Management Office reported that seismicity on Anatahan had significantly dropped, a possible indication that the continuing eruption might be waning. Later in the afternoon, small explosions and long-period earthquakes began to occur.At about 4:46pm Sunday, the volcano experienced a six-minute eruptive pulse that sent ash to 40,000 feet. Upper level ash clouds moved south-southeast and eventually dissipated. "However, despite the ash dissipating, volcanic smog reached Tinian and Saipan and a commercial pilot reported volcanic smog at 20,000-30,000 feet," the agencies said.Anatahan continued to experience small explosions and long-period earthquakes with magnitudes of 1.5 to 2, which occurred at brief intervals of one to a few minutes apart.At 4:30am yesterday, the EMO issued another advisory informing the public that the governor had cancelled the volcanic haze alert for Saipan and Tinian. But Babauta reminded all mariners to avoid passing near Anatahan due to continuous volcanic activity.The EMO and the USGS advised aircraft to take extra precaution within 10 nautical miles of island. The agencies said aircraft should pass upwind of the island or beyond 10 nautical miles downwind, pointing out that conditions could change rapidly and that volcanic activity could suddenly escalate.In joint report yesterday, the EMO and the USGS said a "moderately dense" cloud of ash and steam rose to 20,000 feet and moved northwest. The ash plume extended about 80 nautical miles northwest of the island. "Beyond that, residual thin ash and volcanic smog from last week's continuous eruption extend 360 nautical miles to the west of the island, and a second area of residual thin ash and volcanic smog 30 nautical miles wide and 200 nautical miles long extend northward," the agencies said.Over a week ago, the agencies disclosed that seismic equipment on Anatahan might have been damaged due to the unusually heavy ash emissions from the volcano. They said repairs would be attempted as soon as eruptions drop sufficiently and wind directions change.On June 19, the volcano displayed a series of strong eruptions, which sent ash to 50,000 feet. That activity matched the intensity of Anatahan's strongest historical eruption last April 6, which also sent ash to 50,000 feet. The April 6 eruption spewed out approximately 50 million cubic meters of ash. A rock fall had caused what scientists called a "substantial seismic signal'' and knocked the chunk off the lava dome, which rises from within the main crater that was created in the mountain's historic eruption in 1980. The volcano was relatively quiet for the rest of the day. "Otherwise, the volcano remains relatively quiet and there are no significant changes in seismicity or deformation," a USGS statement read. The USGS and the University of Washington have monitored the volcano closely since it rumbled back to life Sept. 23 with shuddering seismic activity that peaked above magnitude 3 as hot magma broke through rocks in its path. Molten rock reached the surface Oct. 11, marking resumption of dome-building activity that had stopped in 1986. On March 8, it shot ash higher than 30,000 feet, but it has since maintained low-key activity, with wispy smoke regularly floating from the crater. Scientists have said a more explosive eruption, possibly dropping ash within a 10-mile radius of the crater, is possible at any time. The lava dome had built to a point some 500 feet taller than before the spate of eruptions began last fall. But in recent weeks it has been crumbling, and scientists said it was probably lower than its peak but had not recently been measured. Can volcanoes be responsible for cooling off the Earth? With all the interest surrounding climate change after the EU-hosted Green Week, news that volcanic eruptions may play a role in both short- and longer-term climate change stands out. According to research by The Open University, the change referred to is a cooling – not warming – effect on the planet. These findings will help scientists understand new links between volcanic activity and its impact on the environment, experts suggest. Scientists have known for some time that volcanic aerosol particles reflect the Sun’s rays back out to space and also create more clouds which have the same effect. It all helps to cool the planet for a year or two. But the new findings show that volcanic eruptions have another, more indirect, effect. Dr Vincent Gauci, lead author of the research appearing in the American Geophysical Union’s Geophysical Research Letters, says the resulting sulphuric acid from the volcano helps to reduce – through biological processes – a major source of atmospheric greenhouse gases. Such eruptions create a microbial battleground in wetlands, with sulphate-reducing bacteria suppressing the microbes that normally produce the powerful greenhouse gas methane. This has a cooling effect on the planet, the researchers suggest.Laki-like pollution events“We did the simulation on a peat bog in Moray, northeast Scotland, an area we know was affected by the volcanic fallout from the Laki eruption,” says Gauci. There, the scientists found that the reduced methane emission lasts several years beyond the end of the acid rain. “Our calculations show that the emissions would take many years to recover – far longer than volcanoes are currently understood to impact on the atmosphere.”The researchers now think that volcanoes may exert a more powerful influence over Earth’s atmosphere than previously understood. They may even be a more important regulator of wetland greenhouse gases than modern industrial sources of acid rain. Wetland ecosystems are the biggest source of methane and are mostly located in remote areas of the world, away from industrial activity. Indeed, many of Earth’s wetlands seem to be located in volcanically active regions, explain the researchers, such as Indonesia, Patagonia, Kamchatka and Alaska. “Even some wetlands that are quite far away from volcanoes, such as those in Scandinavia or Siberia, will be regularly affected by Laki-like pollution events from Icelandic eruptions,” says Gauci. There was a period of Earth’s pre-history when this effect may have created important climate changes. “This interaction may have been particularly important 50 million years ago when the warm greenhouse climate of the day was due, in large part, to methane from the extensive wetlands that covered the Earth at that time,” Gauci confirms. Montserrat is becoming active again. 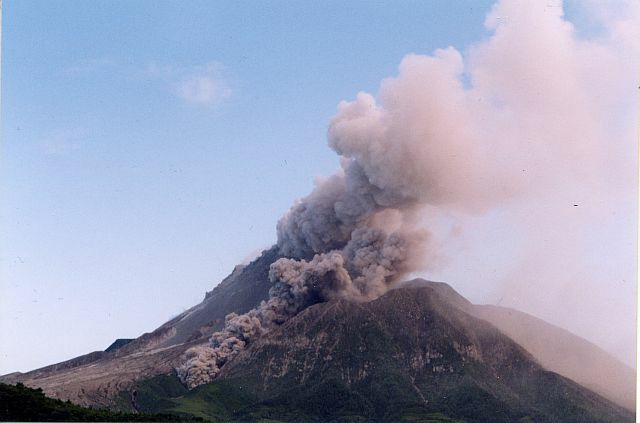 BRADES, Montserrat: On Tuesday, June 28, 2005, Montserrat’s Soufriére Hills Volcano produced its first explosive eruption, since the most powerful eruption recorded on July 13, 2003. The Montserrat Volcano Observatory (MVO) (left) provided the residents of Montserrat with regular and accurate updates. Their June 28, 2005, press release stated that a weak volcano tectonic earthquake, located deep beneath the surface, was the only warning received late on Monday night, June 27, 2005. Seconds after the 1:30pm eruption, a super-heated ash cloud was seen more than 20,000 feet in the air moving in a westerly direction, directly impacting Old Towne, Isle Bay, Corkhill, St. Georges Hill and the Plymouth area with ash fall. The press release further stated that this explosive eruption resulted in pyroclastic flows (pfs) to the sea in the Tar River and a flow one kilometer down Tyers Ghaut. Both of these areas are in the exclusion zone and had no direct impact on the residents of Montserrat. Following an observation flight that same afternoon, MVO scientist determined, while the eruption was explosive in nature and led to pfs, there were no pfs down to Plymouth, the former capital, and points further south. Ash samples were collected from the affected areas to determine whether or not the material was new material from within the depth of the volcano or older material from the dome, itself. There are no restrictions on movement other than in the Exclusion Zone, as activity in the north remained relatively unaffected. Even though, residents inhabiting the northern safe portion of the island were able to witness the rare and stimulating visual sight as the ash plume advanced linearly towards the distant horizon. Seismic activity returned to background levels by mid afternoon. Currently celebrating their 10-year anniversary of the volcanic eruption, some Montserratians said that the Soufriére Hills Volcano is just contributing a commemorative event of its own, while visitors raved at the visual wonder of it all. However, in the recent Scientific Assessment Report, which is produced by the Scientific Advisory Committee (SAC) whose objective is to assess the hazards and risks associated with the volcano, stated that risk is low, based on almost two years of very limited activity. To date, there is no evidence of magmatic activity below the surface of the volcano. However, vigilant monitoring remains Montserrat’s secret to success in dealing with this natural hazard. At the moment, the two main hazards identified in the SAC report were the collapse of remnants of the northwest buttress and mudflows in the Belham River Valley. Having now endured ten years of intermittent volcanic eruptions, Montserrat’s residents say that they are completely aware that their level of safety has not been altered, and this explosive eruption was, more or less, nature’s own fireworks display. Mauna Loa on more active days. Mauna Loa began shuddering a year ago, as swarms of earthquakes suggested an eruption might be on the way. Suddenly the swarms stopped, although the mountain's swelling has continued, indicating something is building far below the surface. Mauna Loa's last eruption, in 1984, was photographed by The Advertiser's David Yamada. The volcano has erupted 13 times in the past 100 years, but as the chart above illustrates, the pace has slowed dramatically during the past half-century or so. Advertiser library photo • 1984Mystified scientists, some of whom speculated late last year that Mauna Loa's 20-year sleep was nearly over, studied their seismographs, tiltmeters, GPS monitors and all their other gear, and decided they couldn't figure out what would come next. "I wish I knew what was happening," said seismologist Paul Okubo of the Hawaiian Volcano Observatory, whose headquarters is perched at the rim of Kilauea's caldera. The volcano shut down right about the time a massive earthquake off Indonesia launched a catastrophic tsunami that swept through the Indian Ocean in late December. But volcano scientists can't show any direct connection between the big quake off Sumatra and Mauna Loa's sudden peacefulness, said Stuart Koyanagi, seismologist with the Hawaiian Volcano Observatory, although he admits the timing is suspect. "We don't really know what happened," Koyanagi said. The mountain continues swelling, although slowly, Koyanagi said. Pick any two distant points across the top of the volcano, and they are growing farther apart, indicating that molten rock is being pumped into the region deep under the volcano. Mauna Loa is Hawai'i's second-most active volcano after Kilauea, which has been in constant eruption for more than 20 years. Mauna Loa has erupted 13 times in the past 100 years, but the pace has slowed in the past half-century. Its most recent eruption was in 1984. Last summer, the volcano launched a pattern of deep quakes whose long-period seismic signatures suggested magma was churning and cracking new pathways underground. "The quakes came in waves, with periods of seven to 10 days of very high activity," Koyanagi said. In August and twice in October, there were periods with 25 to 35 earthquakes daily, although they were unnoticeable to Big Island residents. The observatory's "Volcano Watch" newsletter for Thanksgiving 2004 said: "In the over-40-year span covered by HVO's modern earthquake catalog, no other period has included such large numbers of Mauna Loa earthquakes at the depths now being observed." Starting last Dec. 15, the shaking reached new highs — more than a week of 40-plus temblors a day. For the past six months, Mauna Loa has been dramatically quieter than in the previous half-year, with roughly one earthquake a day and most of them very deep. The observatory has seismic recorders all over the mountain, and by carefully comparing the arrival times of earthquake signals, scientists can establish where a given quake is centered. As long as quakes remain small and deep — 12 to 25 miles below the surface — volcano scientists don't get anxious. When those quakes start showing up nearer the surface, meaning magma is moving up, that's another story. "The earthquake rate has to increase big time, and we have to see them being shallow — a progression where it's shallower and shallower. It can happen any time, but it hasn't happened yet," Koyanagi said. The current quake rate is three times the background frequency of the period before last June. But it is difficult to predict anything when there is not much going on, and even this rate is nothing near what scientists need to feel comfortable making predictions. "I'll make a prediction when I find some shallow seismicity," said geologist Frank Trusdell, the observatory's chief Mauna Loa scientist. "It could be another decade, or it could be next week. Until we get shallow seismicity, we're not ready to forecast the next eruption," he said. Renowned volcano scientist Robert "Bob" Decker died of cancer June 11 at his home in Mariposa, Calif. He was 78. Decker studied volcanoes in Indonesia, Iceland, Central and South America and the United States, and served as scientist-in-charge of the U.S. Geological Survey's Hawaiian Volcano Observatory from 1979 to 1984. Those who knew him said he was most proud of creating the Center for the Study of Active Volcanoes at the University of Hawai'i-Hilo, a cooperative effort between the university and the observatory. The center was established in 1989 to provide training and information on volcanic and natural hazards that occur in Hawai'i and elsewhere. Its international training course in volcano hazards monitoring has instructed nearly 100 scientists from 23 nations in techniques of monitoring active volcanoes and forecasting eruptions. "Bob Decker was a great scientist, but in addition, he always emphasized the importance of public education, and of communication between volcanologists and government," said Darcy Bevens, the center's educational specialist. She said his enthusiasm was contagious, that he loved teaching and was able to explain "complicated scientific ideas in simple language, both in the field and classroom." While at the Hawaiian Volcano Observatory, Decker started writing the weekly "Volcano Watch" column in response to daily inquires about the work being done at the facility. The column continues today, written by different staff members. With his wife, Barbara, Decker also wrote travel and science books, including the textbook "Volcanoes" and the 2001 book "Volcanoes in America's National Parks." In that book, the Deckers, who have a house at Kawaihae, described their lifelong passion for volcanoes: "Volcanoes assail the senses. They are beautiful in repose and awesome in eruption; they hiss and roar; they smell of brimstone. Their heat warms, their fires consume; they are the homes of gods and goddesses." From 1975 to 1979, he served as the president of the International Association of Volcanology and Chemistry of the Earth's Interior, and was credited with introducing innovative technologies, such as using lasers to measure the change in distance across Moku'aweoweo caldera on Mauna Loa. Jim Kauahikaua, current scientist-in-charge at Hawaiian Volcano Observatory, said that because of Decker's early work, scientists have a record of the caldera's widening before the last two eruptions in 1975 and 1984. He said the data are crucial to forecasting Mauna Loa's eruptions. Longtime observatory staff like to tell the story of a going-away party held for Decker the evening of March 24, 1984, before he moved to California. The staff had recognized the signs of an imminent Mauna Loa eruption in 1983 and joked about it in a skit performed at the party. Three hours later, early on the morning of March 25, the volcano erupted, and when contacted at home, Decker had to be convinced it wasn't a joke. Decker was born March 11, 1927. No services are planned. Donations may be sent to the Robert Decker Memorial Scholarship at the Center for the Study of Active Volcanoes, UH-Hilo, 200 W. Kawili St., Hilo, HI 96720. Mt. Oyama's last volcanic eruption happened five years ago. Sunday will mark the fifth anniversary since the start of volcanic eruptions of Mt. Oyama on Miyakejima island, Tokyo. The eruptions resulted in the evacuation of all the island's inhabitants for more than four years. With the evacuation order lifted in February and the island reopened to tourists in May, residents have been steadily rebuilding their lives. However, with the continuous emission of large amounts of poisonous volcanic gas, evacuees from areas with high concentrations of the gas are still spending restless days without permission to return to their own homes. Residents of the Tsubota area, which is polluted by high concentrations of gas, still have not been allowed to move back into their homes. A resident wrote a message on a wall of a house facing a road in the area, reading: "We can't hold on anymore!! SOS." The message was written in November by Yoko Hiyama, a 43-year-old hairdresser temporarily living in Ota Ward, Tokyo, after evacuating the house. A family member suggested Hiyama write something on the wall after repainting it during a brief visit to the house. While happy that residents finally were to start returning to the island, she again realized those in her area were still unable to return home. Wondering what would happen to her future life, she wrote the message on the wall to express her anxiety. Many islanders have seen the message and some were pleased with it, saying it mirrored their own feelings. However, Hiyama was later worried that what she wrote on the wall might have been perceived as being negative as residents were preparing their return to the island. She eventually decided she would erase the message, but when she went back home briefly Monday, she could not help writing the second message beside it on the wall. The message can be translated into English as, "Fresh leaves of spring/The sky over the sea in summer/The sunset in autumn/And the west wind in winter/Are on the island/Residents smile together/But we are not allowed to live or die here." While the islanders who returned home have been working to reconstruct their lives, residents of areas with high levels of volcanic gas have to remain in temporary housing even after returning to the island. The islanders' hardship began on June 26, 2000, when the Meteorological Agency issued an emergency volcanic alert to warn of a possible eruption on Mt. Oyama. The mountain later erupted several times and in September, evacuation directives were issued to the residents. The volcano spewed out 40,000 to 50,000 tons of volcanic gas per day at that time. It now releases between 2,000 to 5,000 tons per day. On some days on the volcanic island of Sakurajima, Kagoshima Prefecture, up to 2,000 tons of gas are emitted, a figure considered high. Using this as a comparison, the emissions on Miyakejima island are still considered to be high. The agency's Coordinating Committee for the Prediction of Volcanic Eruptions announced Tuesday that high gas emissions would continue for a while. On Friday, an alarm was issued in the areas with high concentrations of volcanic gas. As of Tuesday, 1,714 people who used to live in 993 households on the island have submitted forms to confirm their intention to return to the island. So far, more than half of all the residents of Miyakemura are believed to have returned. However, the residents who used to live in the areas with high levels of volcanic gas are only allowed to stay there for four hours a day. One-third of about 300 people from 150 households who cannot return to the areas moved to temporary housing, such as those provided by the Miyakemura municipal government. However, many residents of the areas are said to have postponed returning to the island because they cannot live in their own homes. The islanders, who have been exempt from rent for temporary residences at apartment houses run by the metropolitan government, will have to start paying for them from August. They also will be required to transfer residence certificates to homes where they are currently living. One woman whose house is in one of the areas with high concentrations of volcanic gas said: "This isn't our fault that we can't go home. I'm so sad feeling that we've been forsaken."